Welcome to the BT Guest Wi-Fi merchandising site – order your merchandise to drive customers to make use of your free business Guest Wi-Fi service. All merchandise is provided free of charge, just fill out your details below and we will have a pack on the way! Please use the business name associated with BT Guest Wi-Fi. Confirmation of your order will be sent to this e-mail address. We will also contact you via this e-mail if there are any issues with your order. E-mail opt-in: Please check this box to receive notifications of any future merchandise available from this website. We will not pass on your information to any third party. 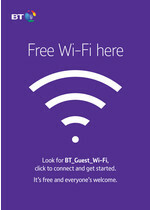 I confirm I am a BT Guest Wi-Fi customer and agree to the terms and conditions. If you have any issues with this pack manager, please e-mail us at btguestwifi@lwvprintworks.com.